ABSTRACT An evidence-based approach is needed to shape policies and practices regarding medical cannabis, thereby reducing harm and maximizing benefits to individuals and society. This project assesses attitudes towards and utilization of medical cannabis and the mainstream healthcare system among medical cannabis users. The research team administered brief hard copy surveys to 450 adults attending an annual public event advocating for cannabis law reform. Among usable responses (N = 392), the majority (78%) reported using cannabis to help treat a medical or health condition. Medical cannabis users reported a greater degree of use of medical cannabis and a greater degree of trust in medical cannabis compared to mainstream healthcare. In comparison to pharmaceutical drugs, medical cannabis users rated cannabis better on effectiveness, side effects, safety, addictiveness, availability, and cost. Due to the medical use of cannabis, 42% stopped taking a pharmaceutical drug and 38% used less of a pharmaceutical drug. A substantial proportion (30%) reported that their mainstream healthcare provider did not know that they used medical cannabis. 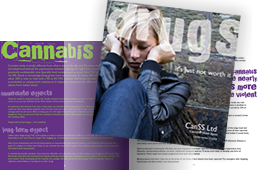 Other issues identified included lack of access to mainstream healthcare, self-initiated treatment of health issues, little knowledge of psychoactive content, and heavy cannabis use.